PostimusMaximus: Reminder that there haven’t been charges yet related to the “substantial assistance” Flynn provided to Mueller. People around Flynn doing criminal things the past few years should be quite worried. Joe Walsh: Why is everyone breathlessly running to their SEPARATE political corners with this Flynn memo? We should all be in the SAME corner, eager to get answers on Russian interference, potential collusion, & potential obstruction. We ALL should be cheering Mueller on. Angry White House Staffer: The conundrum facing Trump right now is hysterical to me. Does he praise Mueller for going easy on Flynn — a good man in the words of POTUS — or does he attack Flynn for cooperating? My vote, FWIW, is that he will attack Flynn as he does everyone. Probably while having a total anxiety attack. Tea Pain: Paul Manafort bet his future on Donald Trump and will spend the rest of his life in jail. Mike Flynn trusted his future to Bob Mueller and he won’t see a day in prison. How about it, Trump Team? Who will you bet you future on? Go see Mueller tomorrow. COB: What Flynn teaches: If you’re going to burn every moral fiber of your character for personal enrichment and maniacal power, then go big. Learn everything you can about the conspiracy, so if you get caught, you can come in from the cold early & save what remains of yo creepy hide. Remember I was talking about this yesterday? (Daily Check-In 12/04/2018) This is by no means definitive proof that Trump is the target of one of the hidden investigations, but it doesn’t help disprove it. Without going into a deep dive on fonts, this document appears to be written in Times New Roman, which is a proportional serif font. So, what the hell does that mean? The serif is that little flourish or squiggly thing hanging off of the edge of a letter. Look at that capital “L”. If you’re viewing this in Times New Roman, which is the font I’m typing this in, you should see that little upswing at the bottom of the ‘L’ That’s a serif. It’s also on the ‘T’, ‘l’, ‘r’, and pretty much every letter and number. If a font is Sans Serif, that means it doesn’t have a serif or flourish. Proportional fonts are fonts in which each character has a different width, depending on the width of an a character. For example, the ‘i’ takes less space than a ‘W’, since it is much more narrow. Monospaced fonts, on the other hand, give each character the same width. This is usually done by squeezing larger letters and extending smaller ones. Now that that’s out of the way, why is any of that important? The sentencing document was written in Times New Roman, 12 point font. That last number is how big the typeface is. Since TNR is a proportional font, that means that words or sentences of the same character length would have different physical lengths. The words ‘Penguin’ and ‘Feature’ both have 7 letters, but are different lengths on the screen and printed copy. It’s not much of a difference to the naked eye, but it’s there. This difference expands as the word or sentence gets longer. The phrase ‘Pittsburgh Penguin Center Sydney Crosby’ has as many letters as ‘I would like to ride a Pegasus to Ohio!’, but they are not the same length. The longer a phrase or sentence gets, it becomes less likely that a two random phrases have the exact same length. Unless all of the characters are the exact same, it’s pretty difficult to get two phrases longer than a couple words to match up perfectly. That’s why what Scott Stedman found is so interesting. The redacted block of text identifying the target of the criminal investigation matches perfectly with ‘President Donald J. Trump’. Don’t get me wrong, this is all speculation at this point, and it could be anything else. However, this is like a key. It’s possible that two random keys fit the same lock, but the likelihood that both keys are completely independent of each other, yet located nearby and used in the same context is highly unusual. John Schindler: Levels of #FAIL: Shack up with bottle-redhead SVR operative half your age. Let her meet all your DC friends & conduct “business” with them. Boast in emails about your “VERY private line of communication” with the Kremlin. Trifecta achieved, dumbfuck! Paul Erickson, a GOP Operative and Maria Butina’s “boyfriend”, just received a target letter from a U.S. Attorney. Erickson, who helped Maria gain access to the highest levels of the GOP Establishment, is likely to be charged with being an agent of a foreign government. If that sounds like espionage, it’s pretty damn close. This law, often called spy-lite, is about as close to being charged as a spy as one can get without facing the death penalty. Butina was arrested on July 16th, and it wasn’t long after that details of Erickson’s involvement came to the forefront. (Daily Check-In 07/16/2018, Daily Check-In 07/31/2018, Daily Check-In 07/20/2018). As a former federal prosecutor, I can’t help wondering: Did Manafort plead guilty to spy for Trump? Wow. Just, wow. As if this couldn’t get any crazier, here come the Saudis paying Trump over a quarter of a million dollars by using a lobbyist of theirs to house veterans at Trump’s DC hotel for the inauguration. Here’s where it gets interesting. When Trump was asked before whether or not the Saudis had any business at his hotels, they said no. Technically speaking, that wasn’t wrong, as it was the lobbyist who paid for the rooms. That’s what we call a middleman. The middleman is the one on the receipt. They turned around, put a markup on it, and gave it to the Saudis who paid them. What’s worse is that they used veterans for this scam. Rudy Giuliani accidentally tweeted a domain. Someone bought that domain and wrote that Trump is a “traitor.” Giuliani is now blaming Twitter for this. The man in charge of the cyber. Just absolutely baffling. Rudy Giuliani alleged Twitter concocted a conspiracy to “invade my text” after he accidentally tweeted a URL to a website. Rudy did get very unlucky, though: The guy who bought the domain he inadvertently tweeted was a web designer late for improv class. Remember, Trump named him the head of Cybersecurity. Opinion | Why Does Alex Acosta Still Have a Job? Melissa Kester: Epstein/Russia/Trump recap: Mogilevich is Putin’s mob boss. He got into western financial markets to launder his money with Robert Maxwell’s help. Robert Maxwell’s daughter, Ghislaine Maxwell, procured girls for Epstein. Including from Mar-a-Lago. Active Measures Doc: All over the world oligarchs connected with the Trump-Russia case have been charged with crimes. I would like to think this is connected to that. Paul Ryan Silent On GOP Power Grab In Wisconsin | Republicans are subverting the will of the electorate in Wisconsin. The outgoing speaker of the House, a Wisconsin Republican, is staying mum. 1. Wow. There is a subplot to the election fraud scheme unfolding in North Carolina that is absolutely insane. This is DEEP in the weeds, but worth it. Let’s go. 2. So Jeff Smith owns a “video sweepstakes” business in Bladen County, which is apparently a place you an go and win money for playing video games. The head of the Bladen County GOP, Landon Bordeaux, goes to Smith and says that he’s about to get raided by the current sheriff. 3. But Bordeaux says, there’s an out. If Jim McVicker wins the 2014 election for sheriff, Smith will be in the clear. 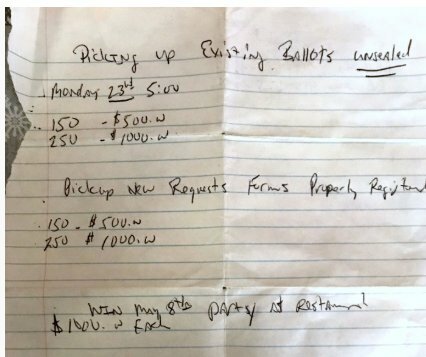 Bordeaux asks Smith to give McCrae Dowless $4000 IN CASH to help McVicker win. So Smith does it. And it works. McVicker wins by 350 votes! 4. But Smith gets stabbed in the back. McVicker raids his video-sweepstakes operation BACKED UP BY HELICOPTERS. Smith is pissed. 6. OK, I’m back. So anyway everything is going swimmingly between McCrae Dowless and Smith until Smith finds out that McCrae Dowless isn’t just running his (probably illegal) absentee ballot operation for Harris — he’s also helping Smith’s arch nemesis McVicker! 11. Smith was clearly desperate to oust McVicker. But he’s not as good at rigging absentee ballots as McCrae Dowless. McVicker defeated his opponent and is still sheriff. Where is goes from here — I have no idea. Maiamimi: Time to get it the f*ck together and stop bashing 2020 contenders. I’m seeing a scary # of tweets about refusing to vote for Biden, Sanders, Booker, etc. There will be a Democratic primary and we better commit to voting for the winner, no matter how imperfect, or we WILL lose. Ming: Has @borisep turned up in locked duffle bag on bottom of Hudson river yet? That’s it for Wednesday. After the bombshells from Tuesday, it felt almost slow. Well, as slow as a massive voter fraud, emoluments lawsuit, and an senior member of the Republican Establishment about to charged with being a foreign agent can get. Manafort’s sentencing document is due Friday. I don’t think we’ll see it before then. I’m going to update Cooperating Witnesses to include Michael Cohen. I forgot to do that last week.